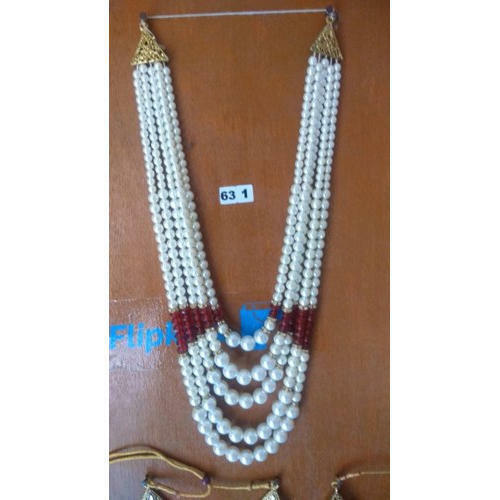 Enriched by our vast industrial experience in this business, we are involved in offering an enormous quality range of Pearl Beaded Necklace. Price Range: Rs. 250 - 300 Per Piece. Established in the year 2018 at Thane, Maharashtra, India, we "Vitthal Rukhmini Production” are Sole Proprietorship based firm, engaged in manufacturing of Beaded Garland, Beaded Necklace, and many more. All our products are getting widely acclaimed among the large clientele for their exclusive designs, superior quality, and reliability. Apart from this, our ability to maintain timelines as well as quality in the assortment, providing cost-effective solutions and assurance to make timely shipment of the orders placed by customers have assisted us positioning our name in the list of top-notch companies of the industry.